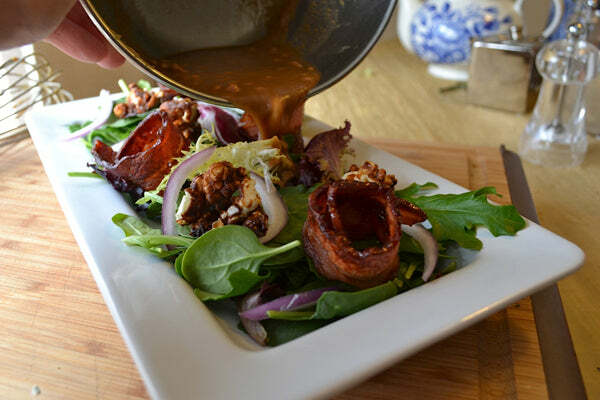 One of my favorite meals consists of candied nuts topping a nice gourmet salad with a well-balanced sweet and salty dressing. 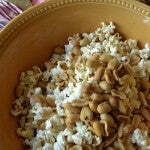 When I was a child I loved to snack on my favorite caramel popcorn loaded with peanuts from a box. I wanted to recreate some childhood memories with a grown-up twist. Instead of candied nuts I created a twist on this classic with a sweet and salty flavored peanut butter caramel corn laden with salty peanuts. 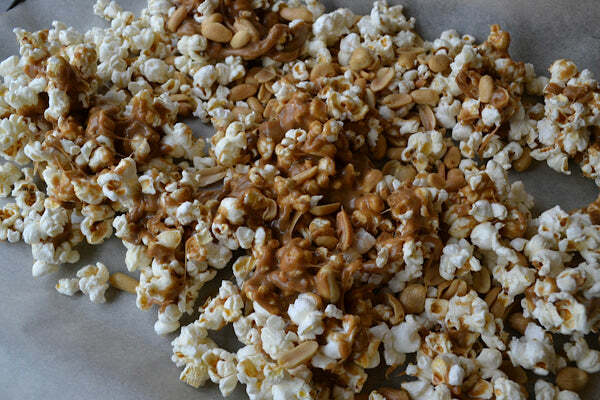 The popcorn roasts in the oven until it develops a crunchy peanut butter flavored caramel coating. They’re perfect as croutons for a nice spring salad. 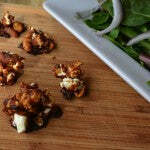 The recipe makes plenty so there is even some leftover for snacking. 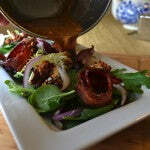 The croutons top a simple gourmet salad with slices of salty bacon and balanced with a sweet and salty peanut butter flavored dressing. This recipe satisfies my craving for sweet and salty flavors in perfect balance. 1. In a shallow frying pan cook bacon until of desired crispness. When cooked drain on paper toweling and allow to cool. 2. 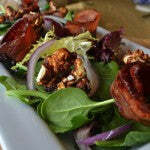 In large bowl toss gourmet salad greens and sliced red onion. 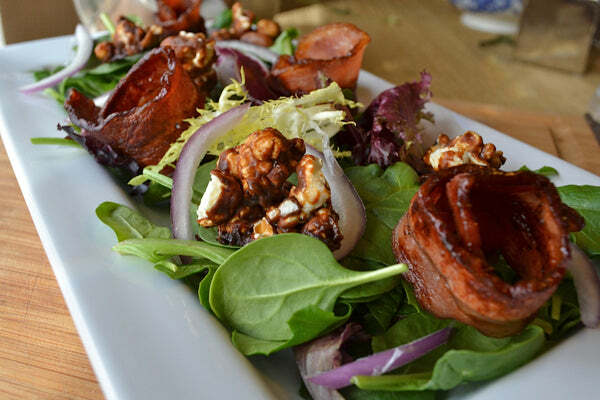 Top with bacon, peanut butter popcorn croutons and toss lightly with dressing. Serve immediately. 1. Preheat your oven to 200°F. Line a large rimmed baking pan with parchment paper and spray it lightly with non-stick cooking spray. 2. To a 4-quart heavy-bottomed pot with lid add 2 tablespoons of vegetable oil. Add the uncooked popcorn kernels and cook over medium heat covered with lid. Leave the lid slightly ajar to allow steam to escape. Once the popcorn begins to pop shake the pot frequently. Remove the pot from the stove and remove the lid once the popcorn has stopped popping. Alternatively pop your popcorn in a popcorn popper according to manufacturer’s instructions. 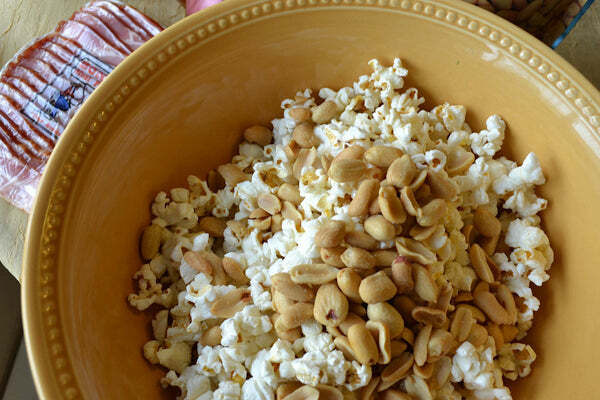 Transfer the popcorn to a large stainless steel bowl and stir in the salted roasted peanuts. 3. In a medium, heavy-bottomed saucepan, combine the brown sugar, corn syrup, butter and salt and bring to a boil over medium-high heat. Continue to boil, stirring occasionally, for about 3 minutes. 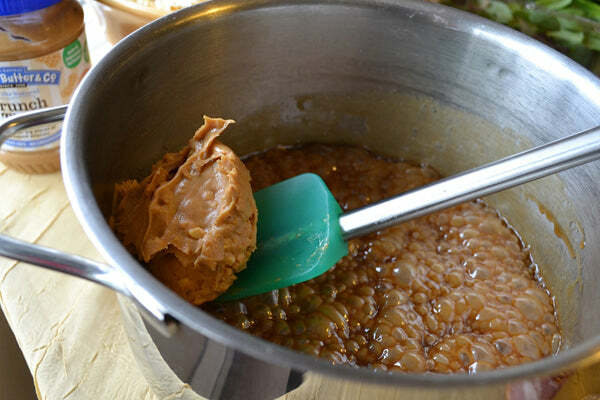 Remove the pan from the heat and stir in the peanut butter until completely melted. 4. 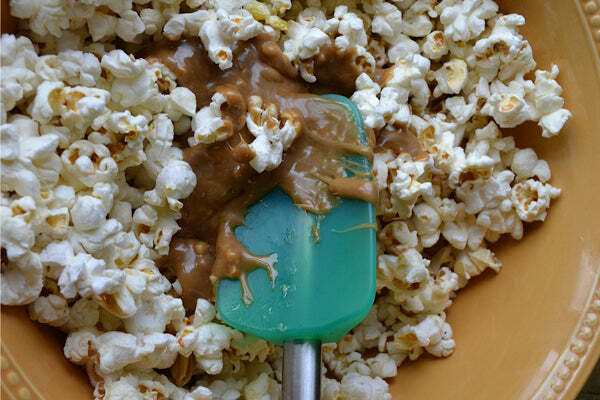 Pour about ¼ of this caramel mixture over the popcorn. Work quickly and remember that the caramel is hot so be careful. 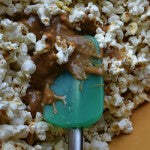 Continue adding the caramel, 1/4 at a time, stirring with a spoon until the popcorn is completely coated. 5. Spread the mixture onto the prepared pan and bake for 15 minutes. 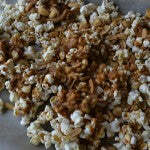 Stir the popcorn mixture then bake for another 15 minutes. Be careful and make sure your croutons do not burn. Cool completely. When cooled, break apart into croutons. 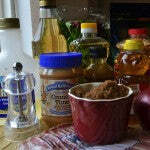 In a small bowl combine the peanut butter, Champagne vinegar, soy sauce, and honey with a whisk. 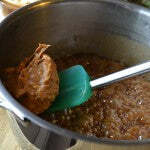 If the dressing is not thin enough to pour add up to 2 tablespoons of warm water. It should be a perfect balance of sweet and salty, with just enough vinegar to keep it from being cloying. Scrape the dressing into a jar you can pour it from easily. 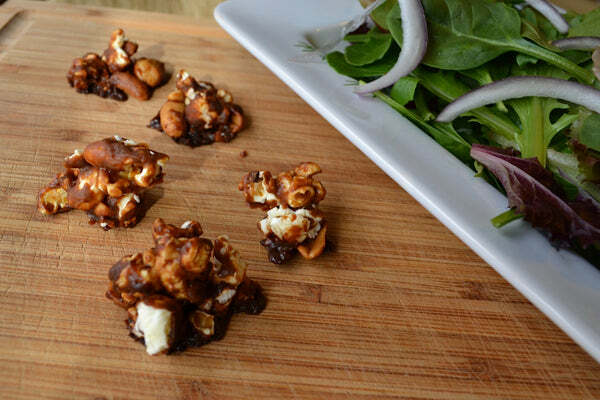 What other dishses, savory or sweet, would you top with these Sweet and Salty Peanut Butter Popcorn Croutons? 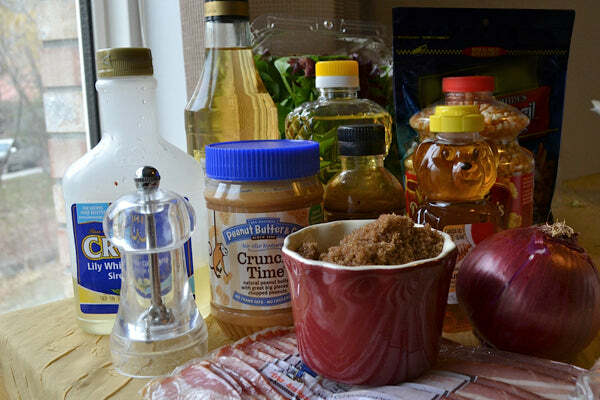 Leave a comment below with your answer to enter for a chance at winning a jar of Crunch Time, the peanut butter used in this recipe. – The giveaway is open to USA residents only and will run until Monday, April 8, 2013 at 11:59 PM EST. – Winner(s) will have until 04/11/13 to claim their prize or we will choose another winner. – Winner will win one 16oz jar of Crunch Time. Product will be shipped by Peanut Butter & Co. The post Spring Salad with Sweet & Salty PB Popcorn Croutons and Sweet & Salty Dressing appeared first on - Peanut Butter & Co. Recipe Blog.